You can apply for your marriage licence within 3 months of your wedding date. However, as it takes at least THREE WORKING DAYS (sometimes four or five) for the officials to process your licence, I would NOT advise anyone to cut it that fine! In fact, as soon as you have your date, venue and celebrant booked, make the application for your marriage licence your top priority and budget item. Legally the application for your marriage licence is known as the “Notice of Intended Marriage”, and in the “biz” it’s colloquially referred to as “BDM60”. I always give my couples a copy of this, and talk you through details and timeframes involved. Remember – there are no silly questions! If you don’t understand something, please ask me! You can also download BDM60 from the Department of Internal Affairs website (www.dia.govt.nz). You can fill it in by hand or online but you cannot submit it electronically. On the form you must complete the questions asked. There are a few things to bear in mind such as: write neatly and clearly! If you have a dry and alternative wet weather venue for your ceremony, write both addresses on the form. if either of you have been married or in a civil union before, and this has been dissolved, you should provide evidence of the dissolution. If a previous partner has died, you will need to give the date of death on the Notice. One of you needs to go in person with the form and the fee ($122.60) to your local office of Births Deaths and Marriages (in Auckland, there is one in Manukau and one in the CBD.) You need to swear a formal statutory declaration (a legal truth) before the Registrar, stating that there is no legal reason forbidding you from marrying, and that everything you have written on the form is true. (NB: The fee for the marriage licence is separate to your Celebrant’s fee for professional services). You will need to wait three working days before going back in to collect your marriage licence and two copies of a document known as the “Particulars of Marriage”. Check all the details typed on the form are correct e.g. spelling, dates, addresses. You are then free to marry at the place specified on the licence and by the Celebrant named on it. If either of these things change for any reason, your licence won’t be rendered invalid, but the Celebrant will need to write a letter to BDM on your behalf explaining the changes and the reason for them. I always ask my couples to give me the “Particulars of Marriage” forms at the rehearsal – they are in effect my tools of the trade and I can’t marry you without them. Don’t leave them at home in a drawer on the day of the wedding (believe me, it happened… once). At some point in your ceremony, you are each required to say your name and the words “I… take you… to be my husband/wife” (or words to that effect). This is to prove to your celebrant (and guests!) that you are marrying each other of your own free will, and that you are who you say you are (i.e. that you are the people named on the “Particulars of Marriage”). The traditional “signing the register” moment in your marriage ceremony is when you and your partner, together with 2 witnesses, sign the “Particulars of Marriage”. The bride needs to sign her maiden name (i.e. the name she woke up with on her wedding day). You can start signing with hubby’s name tomorrow! 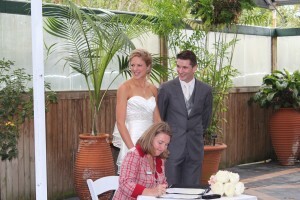 The bridegroom (yup, the bloke) signs his name. Finally, the celebrant checks the forms and signs them too. If you choose to take your partner’s surname after your marriage, you are entitled to use it from the moment you are declared married! It’s not a legal requirement that you do this – some prefer not to. If you do change your name, then you will simply tell your friends, family and workmates that you have done so, and ask them to refer to you by your new surname. To change your name on legal and formal documents, such as your driver’s licence, passport, and bank accounts, you will need a “Marriage Certificate”. This costs $26.50 from BDM, and can be applied for once your marriage has been registered.